CLICK HERE to listen to episode audio (4:35). All Web addresses mentioned were functional as of 2-2-18. From the Cumberland Gap to the Atlantic Ocean, this is Virginia Water Radio for the week of February 5, 2018. This week, that excerpt of “Cold World,” by Kat Mills of Blacksburg, Va., opens a freezing-water episode intended especially for Virginia middle school science students. Have a listen for about 20 seconds to the following sounds, and see if you can guess what cold-world experience was taking place. And here’s a hint: the speaker and the water are both on the move. If you guessed, wading into an icy river, you’re right! 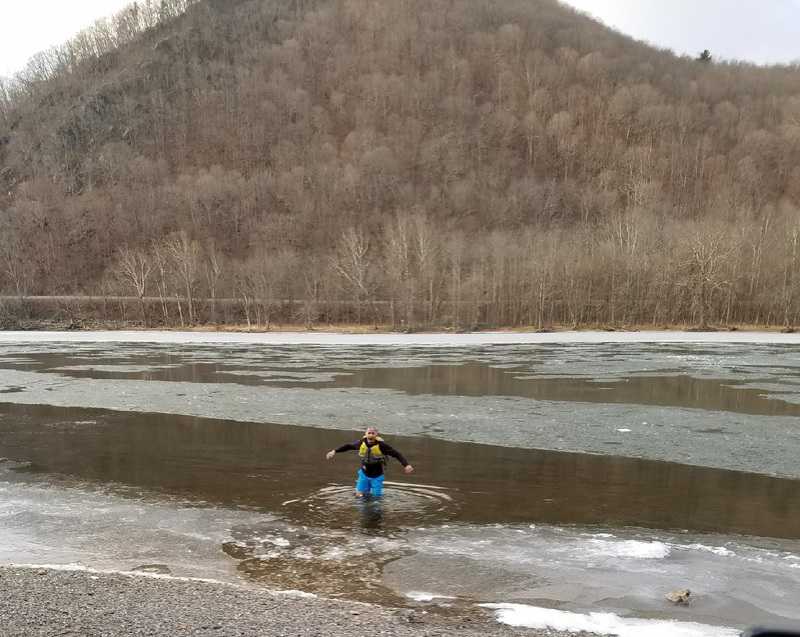 You heard me wading—very quickly!—into the partially iced-over New River in Giles County, Va., on January 1, 2018. After nighttime temperatures in the teens or lower for several days, about half of the river’s surface in some locations on that New Year’s morning was covered in ice. Rivers throughout Virginia will freeze during notably cold winter spells, but it’s not a routine occurrence. River freeze-ups are really noteworthy in the tidal sections of the James, Rappahannock, and other Commonwealth rivers in the Chesapeake Bay watershed; in those sections, the water is somewhat salty, called brackish, so it has a lower freezing point. When rivers do freeze, ice typically forms first at the river edges, where in slow currents surface water can lose heat to colder air and not be mixed with warmer, deeper water. This border ice can also form in slower currents around rocks or other obstacles well away from shore. In stronger currents that keep the water mixed, if the whole water column drops just below the freezing point, ice can form around tiny particles; this type of ice is called frazil. Sometimes frazil gets transported to the river bottom and attaches there, forming what’s known as anchor ice. If the water keeps losing heat to colder air, these and other kinds of ice can accumulate horizontally and vertically, eventually covering the river and perhaps filling much of its depth. Ice may also be carried along by the current, particularly after warming temperatures break up a solid ice cover. If these ice floes get blocked by natural or human-made structures, ice jams can occur. Ice jams can block a river’s flow, leading possibly to upstream flooding. And when an ice jam eventually breaks, it can suddenly release large amounts of water and ice, causing possible hazards downstream. The New River wade-in sounds were taken from a video recording on January 1, 2018, below McCoy Falls in Giles County, Va. Thanks to Virginia Water Radio friends Sarah, John, and Alan for making the recording possible. “Cold World,” on the 2003 album “Long Time,” is copyright by Kat Mills and Sweetcut Music, used with permission. This music was featured in Virginia Water Radio Episode 253, 2-6-15. More information about Kat Mills is available online at http://www.sweetcut.com/kat/ and at https://www.facebook.com/katmillsmusic. Click here if you’d like to hear the full version (2 min./22 sec.) of the “Shenandoah” arrangement/performance by Ben Cosgrove that opens and closes this episode. More information about Ben Cosgrove is available online at http://www.bencosgrove.com. Virginia Water Radio host Alan Raflo in the New River in Giles County, Va., January 1, 2018. Photo courtesy of John Imbur. Ice on the New River at McCoy Falls in Montgomery County, Va., January 1, 2018. Ice on Goose Creek in Loudoun County, Va., January 20, 2018. 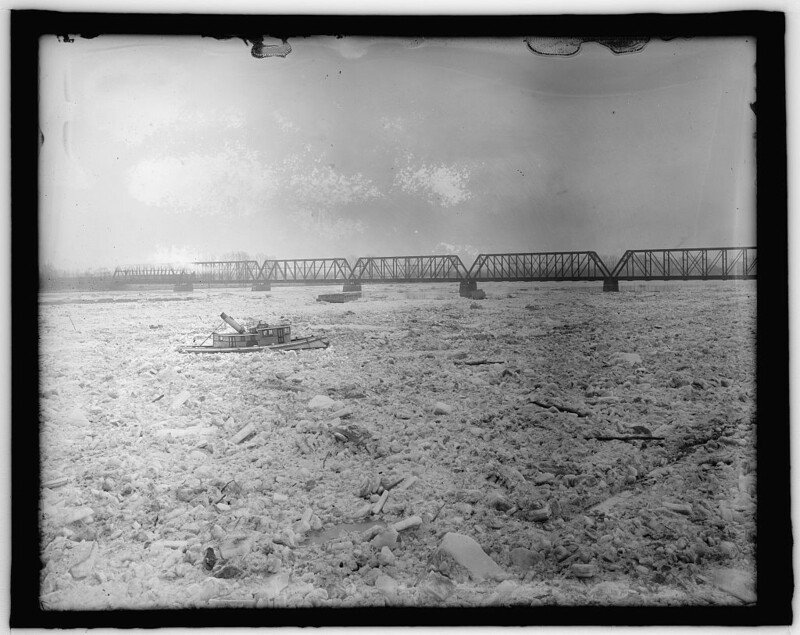 Ice jam in the Potomac River near Washington, D.C., February 1918. Photo from the Library of Congress Prints and Photographs Division, accessed online at https://www.loc.gov/item/npc2008011359/. For more historic Potomac River ice photos in the Library of Congress, see https://www.loc.gov/photos/?q=Potomac+River+ice. “The National Weather Service (NWS) in Chicago/Romeoville, IL, is looking for individuals that live or work along rivers to become part of our River Ice Spotter network. It consists of ice spotters living or working along area rivers, especially the Kankakee, Fox, Des Plaines, Du Page, Rock and Pecatonica Rivers. Spotters along other area rivers are welcome to participate as well. River ice spotters provide valuable data on ice cover and ice jam flooding to our office. Ice jams can result in rapid and devastating flooding. Although the NWS does monitor automated river gages, they typically do not accurately reflect the conditions upstream and downstream of a river gage due to the isolated nature of ice jams. It is also important to know the extent of the current ice cover and other conditions. That kind of information can only be obtained from visual observations. “Under no circumstances are river ice spotters to actually go out on the ice! Your safety is important to us. Observations should be made from a safe location only. Kevin Ambrose, The Potomac River has a history of disastrous ice floes during a rapid thaw, Washington Post, 1/10/18. Spyros Beltaos, ed., River Ice Jams, Water Resources Publications LLC, Highlands Ranch, Colo., 1995. Spyros Beltaos, ed., River Ice Breakup, Water Resources Publications LLC, Highlands Ranch, Colo., 2008. Tamara Dietrich, Arctic blast not enough to freeze James, York rivers, [Newport News, Va.] Daily Press, 2/19/15. Don M. Gray and Terry D. Prowse, “Snow and Floating Ice,” Chapter 7 of Handbook of Hydrology, David R. Maidment, ed., McGraw-Hill, Inc., New York, N.Y., 1993. Erica Leayman, Frozen Potomac River, Lakes Show Just How Cold It Is; From boats stuck on the ice to people skating on reflecting pools, here's a visual reminder of the bitter cold around the DC area, Old Town Alexandria [Va.] Patch, 1/3/18. National Weather Service, Blacksurg, Va., Forecast Office, “Observed Weather Reports/Preliminary Monthly Climate Data for Blacksburg, online at http://w2.weather.gov/climate/index.php?wfo=rnk. Episode 404, 1-22-18 – on ice on ponds and lakes, for 4th grade through 8th grade.